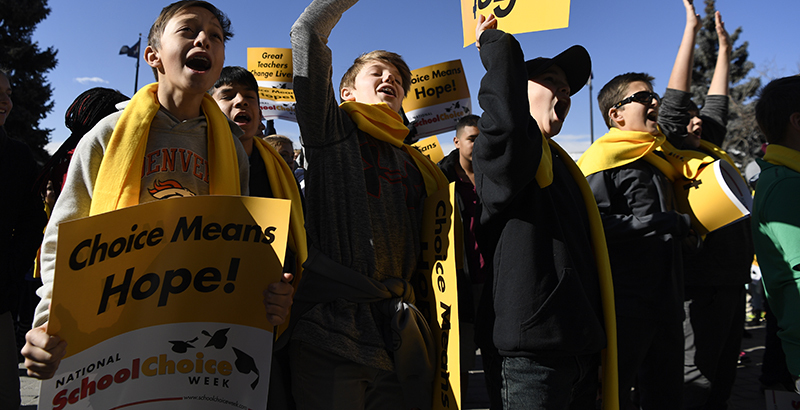 It’s about time we put to bed the false claim that managed competition is better than a free market when it comes to school choice. Tulane University professor Doug Harris promoted this view in a recent Brookings Institution article, claiming that “the economics case against vouchers is stronger than the argument for it,” and therefore, we ought to have government heavily regulate the education market. Harris declares “market failure” in schooling because “Economics tells us that markets work best when consumers have good information and many options to choose from, and when the decisions made by one family do not affect others,” but (1) families do not have great information, (2) families do not have a lot of schooling options, and (3) schooling decisions affect the rest of society. In other words, because schooling does not mirror the model of perfect competition that we learned in Economics 101, government ought to step in. Here’s why many economists disagree. Although it is true that families do not have perfect information about schools, it is likely that they have much better information about what their children need than government officials do. Parents have the local knowledge necessary to make informed schooling decisions; bureaucrats sitting in offices hundreds of miles away do not. Parents also have the incentive to make the best decisions possible for their children. Bureaucrats have the incentive to make the best decisions possible for special interests; after all, political profitability relies on maximizing votes, not on learning. Besides, we already allow rich parents to make schooling decisions. Why not let disadvantaged families do the same? Parents choose schools based on a multitude of difficult-to-measure factors such as safety, culture, peer groups, and discipline policy. The decisions are based on each child’s unique situation. When parents are given school choice, studies show that they gather more information on school quality and even start online message boards to share what they’ve learned. But bureaucrats employ crude measures — most often standardized test scores — to try to capture school quality. There are two main problems with that. First, as the University of Arkansas’s Jay P. Greene frequently points out, there is a growing body of rigorous empirical evidence suggesting that test scores are not strong predictors of more important long-term outcomes such as graduation rates, college enrollment, earnings, and adult crime. Second, choosing one uniform measure assumes all children need the same type of education. Let’s imagine a situation where a government official tries to shut down an oversubscribed charter school in a poor neighborhood based on subpar test scores. Shouldn’t we wonder why families in need are desperately banging on the doors of the school despite less-than-optimal standardized test scores? Could it be that their children are in a safe environment that teaches character and citizenship skills? After all, what good are test scores in a job interview? What good are they for a child who ends up in jail? Perhaps parents are on to something. Imperfect information exists in all aspects of life. We are not nutrition experts, yet we are allowed to feed our children. We are not fashion designers, yet we are allowed to clothe our children. Do free-market skeptics think we should take away those basic liberties as well? It may be true that parents do not have a lot of options in the current system, but we shouldn’t expect that to be the case in a true education market. Currently, less than 1 percent of the school-age population has access to a private school choice program; we shouldn’t expect a diverse array of private schooling options with government severely stifling competition. However, the public education budget is north of $630 billion, more than three-quarters the size of the restaurant industry. We certainly don’t have a shortage of diverse options for restaurants in the U.S. Just imagine the diversity of educational options that would be available if all families could allocate education resources to best fit their children’s unique needs. It’s exciting — yet depressing — to think about the wide array of high-quality education options that would be available in a system where all children could go to the school that worked best for them. Even if we accepted the fragile argument that we wouldn’t have many options in a free market for education, managed competition wouldn’t solve the problem. It would make it worse. As we know from basic economics, regulation serves as a barrier to market entry. It also makes the supply of schools more homogenous. As shown below, the results of a study by Lindsey Burke and me suggest that Louisiana’s highly regulated voucher program significantly increased the likelihood that individual private schools identified as “regular” schools and decreased the likelihood that they identified as “specialized” or “alternative” schools. Obviously, when government tells private schools what to do, private schools begin to look a lot more like public schools. Why in the world would we want to make all schools similar to the failing ones that families are desperately trying to escape? Harris argues that we ought to have bureaucrats close “bad” schools because schooling has something economists call externalities — “costs imposed or benefits conferred on others that are not taken into account by the person taking the action.” If my child gets a great education, others benefit from that because they get to interact with my child. If my child gets a poor education, others may not benefit from interacting with my child. The usual policy responses to economic externalities are taxation and subsidization, rather than heavy regulation. But even for those policy responses to work as theorized, bureaucrats would need to have accurate measures of education quality to determine how much subsidization (or fees) each school ought to receive. Even the economist who developed the theory of externalities, Arthur Pigou, pointed out that society may actually end up worse off if we don’t know the socially optimal level of government intervention. Of course, the externality argument can be made for any good or service. But that doesn’t mean government action ought to be taken for all goods and services. For example, automobiles have positive effects on others in society; if I can get from my home to my office rapidly by driving a fast car, others will benefit, because I can spend more time at work producing new research. And, of course, a nice car would make me feel happy, and we all know happy employees are more productive. But just because others would benefit from my additional research and presentations, should the rest of society subsidize my decision to buy a sports car? Of course not. Harris is correct that schooling does not fit into the model of perfect competition. But his policy recommendations exacerbate all the problems he identifies. This is just bad economics. Corey DeAngelis is an education policy analyst at the Cato Institute and a distinguished doctoral fellow at the University of Arkansas.